Hi everybody! I´m Nockiman, I´ve 26 years old and since I was a teen when I was introduced to digital art. 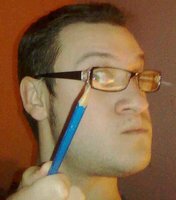 I start drawing at age 15 and I don´t pass a day without continuing to perfect my art. I work very hard to perfect my craft and to keep my style unique! I create my own worlds when drawing. This it´s the principal reason for which I make my art . From time immemorial, humans have had a need to show art on the walls of caves to tell his story. Now 60,000 thousand years later we continue doing the same thing but on computer.